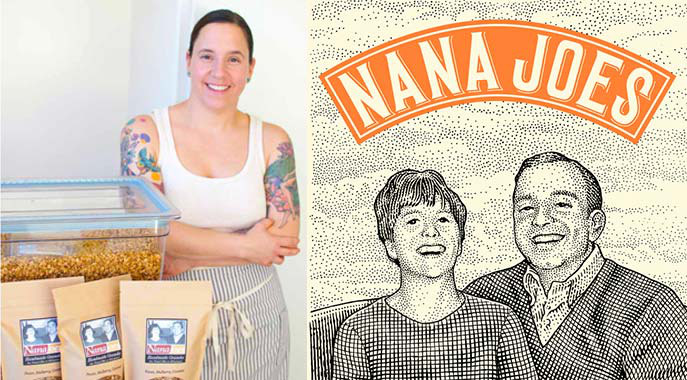 Nana Joes Granola: Support us with edible credits. Nana Joes was born out of the need for a healthy whole food breakfast to sustain long surf sessions and to nourish the active body. We focus on vegan and gluten free granola, granola bars and cookies. All our granola is maple syrup sweetened and hand mixed, using the freshest ingredients. We source mainly from the farmers' markets, and believe in supporting other small businesses. Our best feedback is when farmers' market patrons tell us they had our granola for breakfast and they weren't hungry until lunchtime! Michelle Pusateri, a trained pastry chef, developed the recipes for a full flavor profile. We focus on a crunchy texture and give our granola a little sweetness with pure grade b maple syrup from Hudson Valley New York. We will use your prepayment to continue to do recipe research to bring you more products like our cookies and granola bars, and to grow our team with two more hires! What better way to use our resources? At the register, use the Credibles app on your smartphone to redeem your credits for Nana Joes Granola.